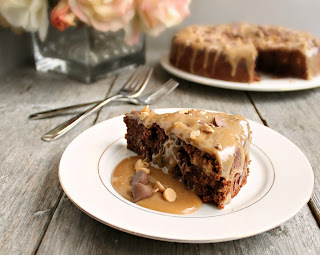 If this cake looks familiar, it's because it was my offering for the Muffins for Muffin online bake sale last week. A big thank you to everyone who bid, bought or donated because the sale raised a lot of money for Muffin's medical needs. And a personal thank you from me to the many of you who bid on my cake and particularly to the winning bidder, Arturo, for his extraordinary generosity. I sincerely hope that you enjoyed your sweet treat. I came to understand there were a number of folks who were quite disappointed either to have been outbid or to find the auction's prices for this item had gone above their budget. 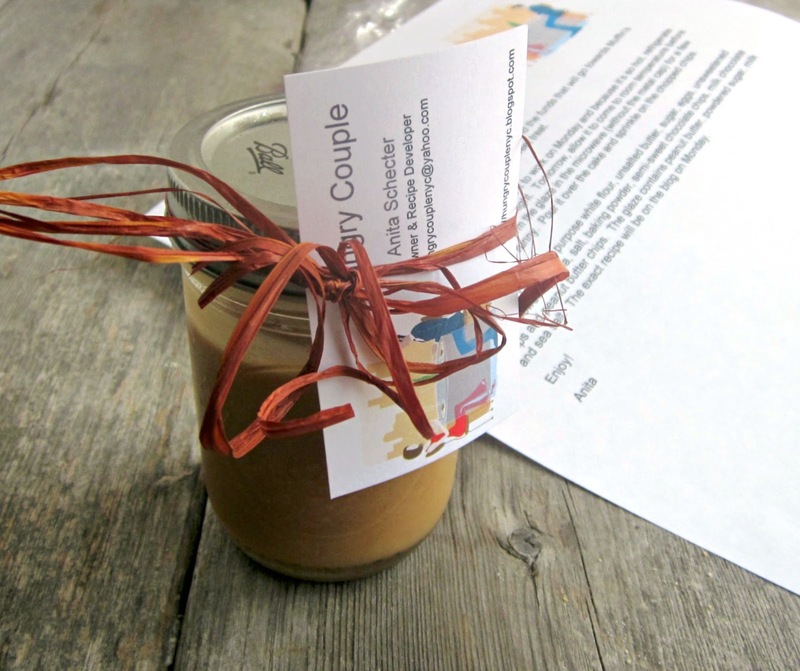 So I'm offering a consolation prize today by sharing the recipe with you. It's really not very difficult to make and, in my opinion, it's the glaze that puts it over the top. Chocolate cakes on their own can be a bit boring which is why I loaded this one up with both chocolate and peanut butter chips. But the glaze...oh, I'd be willing to give up the cake altogether and just have a big jar of this glaze and a spoon! While typical peanut butter frostings are cloyingly sweet, I wanted that sweet/salty thing to go with the rich chocolate. 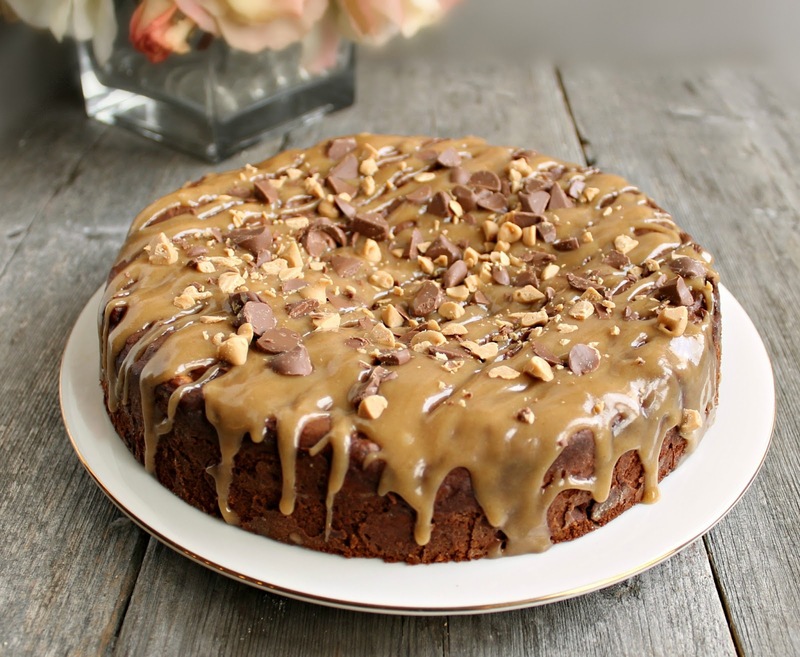 Salted caramel may be all the rage but I'll take salted peanut butter glaze any day. Enjoy! Add the sugar and eggs to a large bowl and cream together for a couple of minutes, with a hand mixer, until the eggs are a light golden color. Beat in the butter until smooth. Add the vanilla, sour cream and water and mix thoroughly. In a separate bowl, sift together the 1 1/2 cups of flour, cocoa powder, salt and baking powder. Add the flour mixture into the egg batter and mix just until combined. Add the chocolate and peanut butter chips to a small bowl, add the tablespoon of flour and mix together. This will help prevent the chips from sinking to the bottom of the cake while baking. Add the chip mixture to the batter and fold in with a large spoon just until incorporated. All packed up and ready to go to the winning bidder. Butter and flour a 9" round spring-form pan and pour in the batter. Bake in a pre-heated 350 degree oven for 50 - 60 minutes or until a cake tester comes out clean. Allow to cool before removing from the pan. Make the glaze by combining the peanut butter, powdered sugar and milk in a small bowl and whisking until completely smooth. Add a pinch of sea salt, taste and see if you'd like it saltier. When the cake is out of the pan, pour the glaze over the top and decorate with a couple of tablespoons of additional chocolate and peanut butter chips, if desired. Makes approximately 10 servings. This looks like peanut buttah heaven! OMG! The glaze sounds amazing. Anita, you're the best. You're a giver, as evidenced by the sharing of this amazing recipe. I'm going to be drinking a lot of salted peanut butter glaze in the near future! 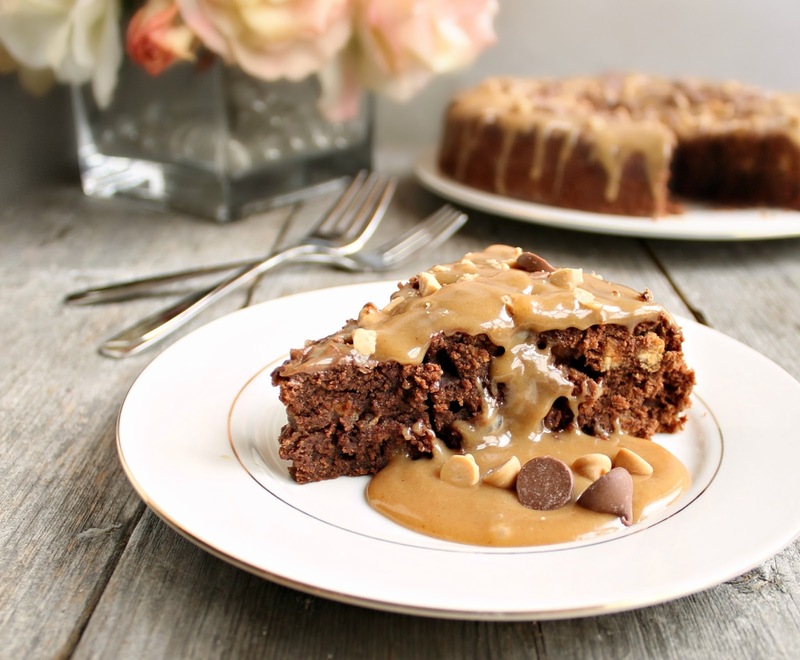 Chocolate and Peanut Butter are one of my favorite combos and this cake looks lovely. My son-in-law and I could eat the entire thing - at once! This recipe was in my email yesterday morning and I decided that we had to try it. What a winner!! Thank you so much for this great dessert. Anita... We are loving this cake!! love how the color of the glaze and its salted!!! YUM! It's a gorgeous looking cake!! Life in the Big City - Happy Birthday to Me! Muffins for Muffin Online Bake Sale!